From Disney and visionary director Tim Burton, the all-new grand live-action adventure “Dumbo” expands on the beloved classic story where differences are celebrated, family is cherished and dreams take flight. Circus owner Max Medici (Danny DeVito) enlists former star Holt Farrier (Colin Farrell) and his children Milly (Nico Parker) and Joe (Finley Hobbins) to care for a newborn elephant whose oversized ears make him a laughingstock in an already struggling circus. But when they discover that Dumbo can fly, the circus makes an incredible comeback, attracting persuasive entrepreneur V.A. 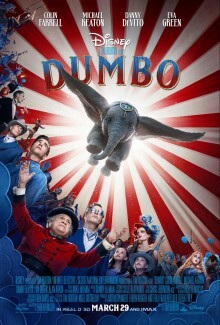 Vandevere (Michael Keaton), who recruits the peculiar pachyderm for his newest, larger-than-life entertainment venture, Dreamland.Dumbo soars to new heights alongside a charming and spectacular aerial artist, Colette Marchant (Eva Green), until Holt learns that beneath its shiny veneer, Dreamland is full of dark secrets. Join LatinoScoop at an exclusive advance screening of DUMBO in select locations below. Click on the city name below for your city and enter the code. If you download a screening pass and aren’t able to use it, please share it with someone who can attend. There is a limited number of passes available for each location. Screening passes are available on a first-come, first-serve basis. Additional passes will not be added once they are all redeemed. Anyone downloading a screening pass is advised to arrive early to secure seating. The theater is intentionally overbooked by the studio to ensure a full house. Plan accordingly to arrive at the theater with enough time. All advance screenings will take place on Wednesday, March 26.